about an hour earlier to use in making poisson cru. How did we find ourselves eating the freshest poisson (South Pacific ceviche) cru coco au lait (coconut milk) ever in the Marquesas? Not quite sure how it happened.... If we invited ourselves or were invited by the local "boys" on Tuahata's HanaMoeNoa beach. All I remember is somehow we got into a conversation that afternoon and agreed to to return that eve for poisson cru au lait, bringing a dish of our own to round out the meal. As we left, they sent us off with a huge bag of over 20 limes, several just picked pamplemousse and oranges. on the beach of Tuahata's HanaMoeNoa. Seems "the boys" took over their aunt's copra operation a couple months prior, while she went to France. Steve, who appeared to be in his late teens or early 20s, spoke passable English. 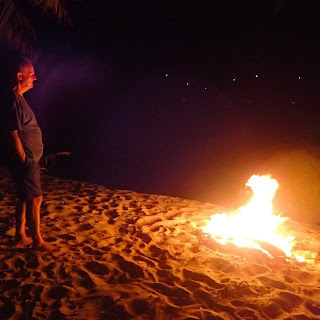 His friend was in his mid-20s, and I confess to not catching his Marquesan name fully; let's call him Hamu, for the sake of this blog post. We hustled back to our boat and I made the fastest ever chicken picatta (chicken, cooked with vermouth, chicken stock, lemon juice, onions, mushrooms, garlic, capers and served over rice) and green bean, blue cheese and viniagrette salad. Despite the substantial ring of rum bottles surrounding one of their coconut trees, we understood bringing hooch was still optional; we still brought some from our meagre supply. Who knew dogs liked coconut meat? I take a pass at making coconut milk for the poisson cru coco au lait. 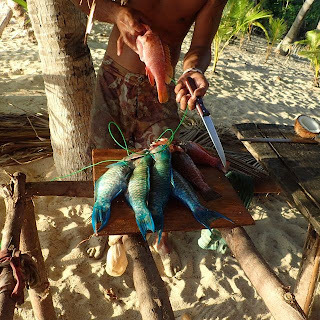 Hamu, meanwhile, speared several parrot fish and was busy filleting them when we returned. Then Hamu finely chopped garlic onions and freshly squeezed lime juice into a marinade that "cooked" the fish. Steve took charge of creating the coco au lait*. 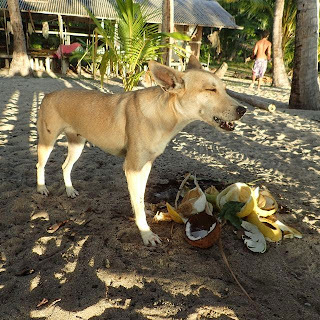 He demonstrated how to husk the coconut (Wayne then husked one), then split the husked coconuts. We declined following suit as we're still not that comfortable with machetes. Some of the coconut water drained we drank, some was reserved for the coco au lait. 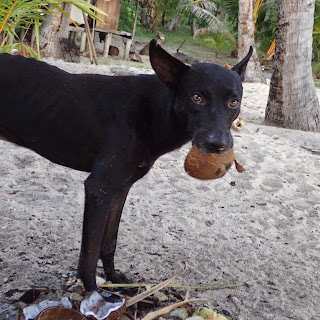 *Shot some short videos of the coconut husking and shell cracking via machete which will be added later to this post. The split coconut meat was scraped into a bowl. 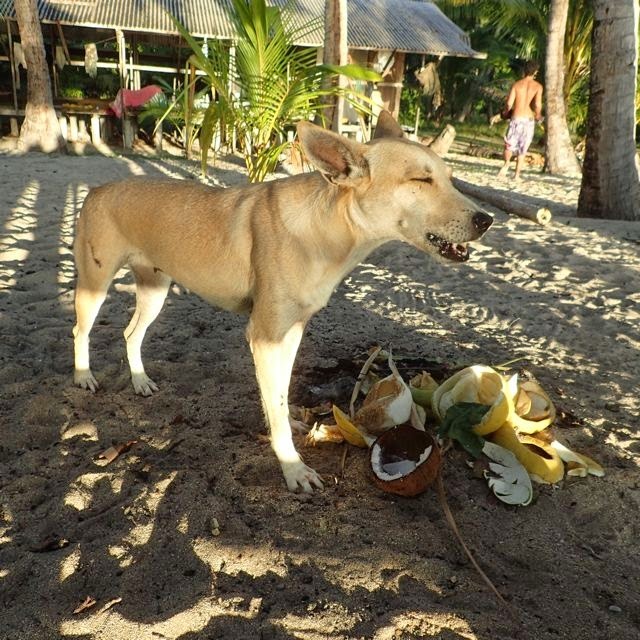 Again, Steve demonstrated, and this time I scraped one of the coconuts. Next the coconut meat shavings were placed into the center of a cheesecloth-like fibrous coconut cloth. 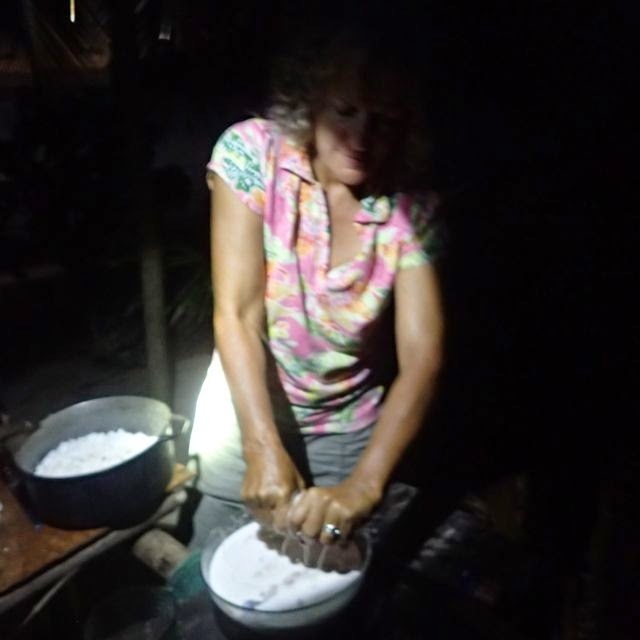 The cloth was then folded over the coconut meat shavings. Hamu demonstrated how they creamy coconut milk was wrung through the cloth, twisting it first one way, then the opposite way over the bowl of reserved coconut water. I took over that task for a bit while Hamu took a "smoke break." 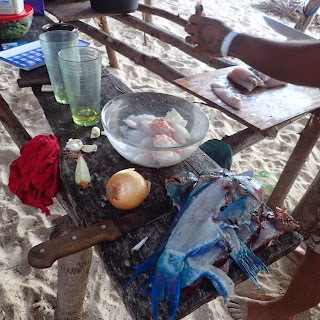 Wayne returned to the boat for more rum ("Men drink rum straight," they declared and so it went quickly....), and also gave Steve and Hamu some of our light fishing tackle. Afterward, we enjoyed a campfire, gazing out over HanaMoeNoa Bay. Afterward, the boys washed the dishes and eagerly accepted the leftover chicken piccata and rice we took the the leftover poisson cru. Everyone was happy. I'm not sure if the boys will remember us (after all - there were a lot of rum bottles left by prior guests! ), but we will never forget the experience. And I will never look at coconut milk or poisson cru the same way again. twinkle like stars in the background. This happened when we were anchored at Marquesas Hanamoenoa Tuahata, French Polynesia (S9.54.494 W139.06.342);our third Marquesas island stop. We are currently on our fifth and final Marquesas island stop, Nuku Hiva (S8.54.856 W140.05.880) , before moving onto the Tuomotos, which are still part of French Polynesia. Check back periodically for an update with video on preparing coco au lait. Given limited internet and power - it may be a while. Wow. I only dream of the South Pacific. Love your posts!!! Stay safe and cherish every single moment. Maybe the Ara Nui? Watch for a future post on that. Miss you & Nancy. Hugs!